The Needle Biopsy of Lung Mass procedure is used to determine, if the mass is cancerous or not. 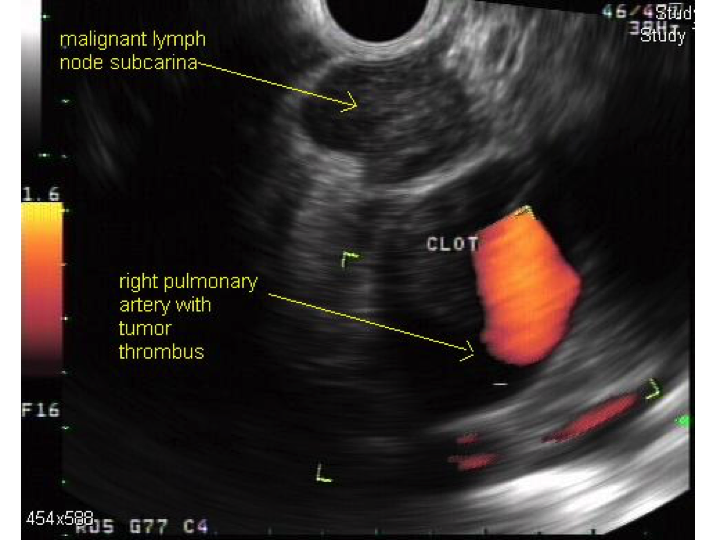 This is an image of an endoscopic ultrasound (EUS) showing a dark (hypoechoic) malignant appearing lymph node adjacent to the esophagus and close to the pulmonary artery. A Lung Mass Needle Biopsy procedure involves the lungs of the chest. A transducer is used to send high frequency sound waves in the body and the computer creates the image based on the echoes of that sound returning from the patient’s body. The CT scanner looks like a big box with a hole inside. The examination table on which the patient is lying down slides the CT scanner. X-ray tube and electronic X-ray detectors rotates around the patient. Needle biopsies are often performed with the guidance of a imaging tool, such as a computed tomography (CT), fluoroscopy, ultrasound, or MRI. Different instruments, such as ultrasound, CT, fluoroscopy, or MRI scanners may be used to guide the needle during a needle biopsy. There have been no recent advances to replace the Lung Mass Needle Biopsy procedure. What is the Cost of performing the Needle Biopsy of Lung Mass radiology procedure? The cost of the Lung Mass Needle Biopsy procedure depends on a variety of factors, such as the type of your health insurance, annual deductibles, co-pay requirements, out-of-network and in-network of your healthcare providers and healthcare facilities. How does the Needle Biopsy of Lung Mass radiology procedure work? The Needle Biopsy of Lung Mass works in the following manner: Using one of the imaging techniques, the physician inserts one of the following needles through the skin and guides it to the suspicious abnormal part of the organ, to remove the sample. How is the Needle Biopsy of Lung Mass radiology procedure Performed? A Lung Mass Needle Biopsy procedure is performed as an outpatient procedure, at a hospital. The Lung Mass Needle Biopsy procedure is usually done by a radiology technologist. The Needle Biopsy of Lung Mass procedure takes about an hour to perform. The patient may be asked to stop taking certain medications, such as aspirin or other blood thinner medicines, before biopsies. A physician will request your consent for a Needle Biopsy of Lung Mass procedure using an Informed Consent Form. What are the Limitations of the Needle Biopsy of Lung Mass radiology procedure? What is the Lung Mass Needle Biopsy procedure? What is to be expected during the Needle Biopsy of Lung Mass radiology procedure? A local anesthesia will be administered to numb the path of the needle, during the Needle Biopsy of Lung Mass procedure. A general anesthesia may be needed for children. There is only a minimal blood loss involved, during the Needle Biopsy of Lung Mass procedure. What are the possible Risks and Complications during the Needle Biopsy of Lung Mass radiology procedure? What Post-Operative Care is needed at the Healthcare Facility after the Needle Biopsy of Lung Mass radiology procedure? There is no postoperative care necessary after the Needle Biopsy of Lung Mass procedure, at the healthcare facility. What is to be expected after the Needle Biopsy of Lung Mass radiology procedure? If the patient is experiencing any infection at the needle site or some unusual signs and symptoms, then do contact the physician. What Post-Operative Care is needed at Home after the Needle Biopsy of Lung Mass radiology procedure? There is no postoperative care required after the Needle Biopsy of Lung Mass procedure. In most cases, the patient needs no recovery time after the Needle Biopsy of Lung Mass procedure. Who will you receive a Bill from, after the Needle Biopsy of Lung Mass radiology procedure? The patient is advised to inquire and confirm the type of billing, before the Needle Biopsy of Lung Mass procedure is performed.